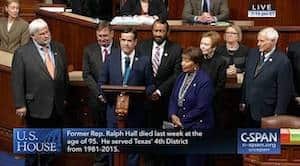 WASHINGTON – Rep. John Ratcliffe (R-Texas) gave a speech on the floor of the U.S. House of Representatives Monday in commemoration of former Congressman Ralph Hall who passed away at the age of 95 last week. He then led the Texas delegation in a moment of silence in Hall’s honor. At age 19, Ralph Hall jumped at the chance to join the Navy to fly Hellcat Fighters during World War II in defense of this nation. Seventy years later, at the age of 89, he jumped again out of an airplane, to honor America’s veterans on Memorial Day. At age 11, Ralph Hall was working at the Rockwall, Texas drug store when he served two Coca-Colas, two packs of Old Gold cigarettes and a stack of newspapers to two customers known simply to the rest of the world as Bonnie and Clyde. From beginning to end, Ralph Hall lived one of the most extraordinary and remarkable lives of anyone ever to serve in Congress. Neither of those was true, but it was that self-deprecating humor that made Ralph Hall beloved to everyone that knew him. In the Science, Space and Technology Committee room, Ralph Hall’s picture hangs alongside other past chairmen, but Ralph is the only chairman to have Neil Armstrong, Buzz Aldrin, Gene Cernan and every then-living Apollo-era astronaut come to his home to celebrate one of his birthdays. When asked why, Neil Armstrong, the first man on the moon, who famously took a giant leap for mankind, said it was because Ralph Hall was a giant to our space program. Ralph Hall, he said, was a giant among men. Mr. Speaker, to those on the floor who knew Ralph Hall, thank you for allowing me to remember him for the representative that he truly was. And for those of you who did not have the privilege of serving with Ralph Hall, thank you for letting me remember the man who was the kind of representative that we should all hope to be. When Ralph Hall passed away last Thursday at the age of 95, he left this Earth, went right past the moon,and our loss became heaven’s gain. Godspeed Ralph Hall.